Damn the Alpine A110. Damn it for its 248 horsepower for 2,400 pounds. Damn it for existing. Most of all, damn it for not being available in America. This isn’t what you would call news. The Alpine A110 has been out for a year or so now, and in all of that time, it has not been available in the States. This is not a change of any kind. The Alpine A110 is, it is still, it is still not something I can buy here and drive here and see here, cutting up tight mountain roads and quietly turbo-whooshing through little towns in Marin county or anywhere else in this country for that matter. 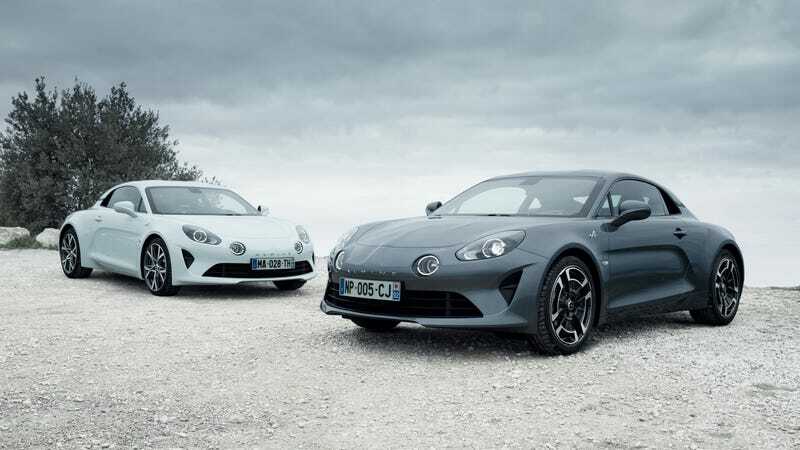 This all came up when Alpine recently announced the pricing for two new trims for the A110, which, if you’re curious, is £46,905 in stripped-out form in the UK, or about five grand less than what an Alfa Romeo 4C ran you over there. Also, look at the stock wheels for the well-appointed Légende. They’re 18s and they’re my favorite stock wheel on the market right now. They’re so good! They are so forbidden! Damn them. Damn them to hell.